When a large US company (Georgia Gulf) says it is going to buy a smaller Canadian company (Royal Group) for $13 but the stock of the company being acquired sells for less than $13… you would think there is a ‘free’ lunch being offered on Wall Street, right? I nibbled (half normal position size) a bit on RYG at $12.50 on Monday but sold it for a small loss as GGC broke below Friday’s intra-day low. 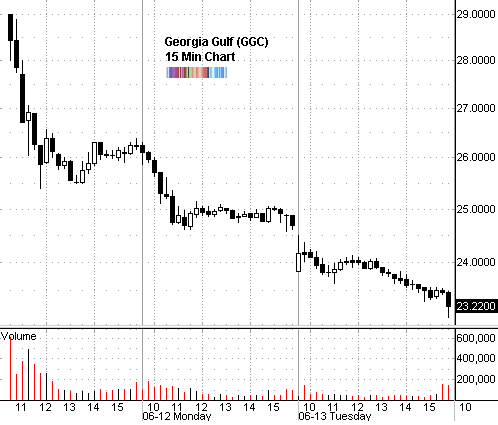 The lesson I learned was that I should have hedged the long RYG position by shorting an equal dollar amount of GGC. 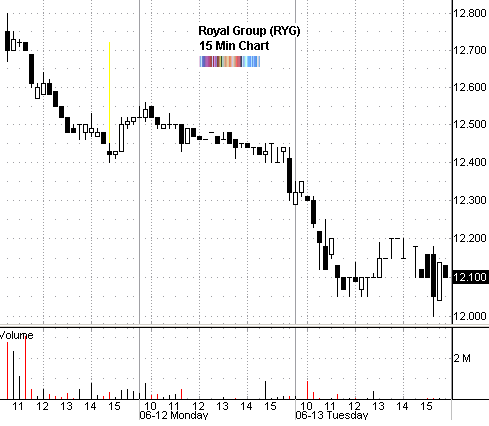 Since the announcement last week, Royal Group has fallen about 5% while its suitor has fallen by about 20%.